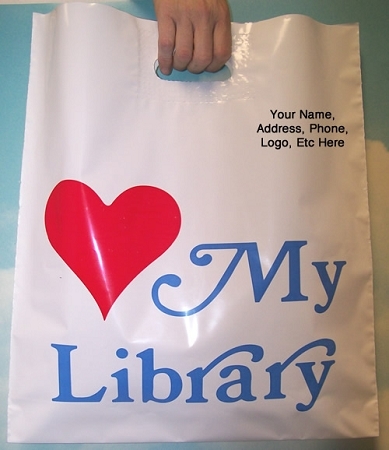 16" X 18" X .003 Love My Library Patch Handle Poly Bags With Your Message Printed In Black In A 3" X 5" Area On One Side Of The Bag Packed 250/case. NOTE: First Time Orders For Semi-Custom Imprints Require Customer Approval Before Printing. After Customer Approves Proof, Please Allow 10-14 Working Days For Production Time.